There are two main routes for the hikes to Scafell Pike, one from Seathwaite Farm by Borrowdale in the north, and the other from Wasdale Head in the west. This Wasdale route to the mountain is slightly shorter, but mainly steeper. The Wasdale Head route is normaly used by hikers traveling up from the south, as it is a long way round from the north. The image below is of the road running up beside the lake named Wast Water, with Scafell Pike mountain over to the right in the clouds. This is a great scenic lake with few trees to obscure your view, unlike most other lakes in England now. Kendal to Wasdale Head Road Map . The image below is of the hiking car park for Scafell Pike at Wasdale Head, with the Wasdale Head Inn up to the left, the road ends at the inn. The inn has a camp site, and the larger National Trust campsite is a few hundred yards back down the road, at the north end of Wast Water. This image was taken from the start of the main Scafell Pike trail, about 240ft above sea level. 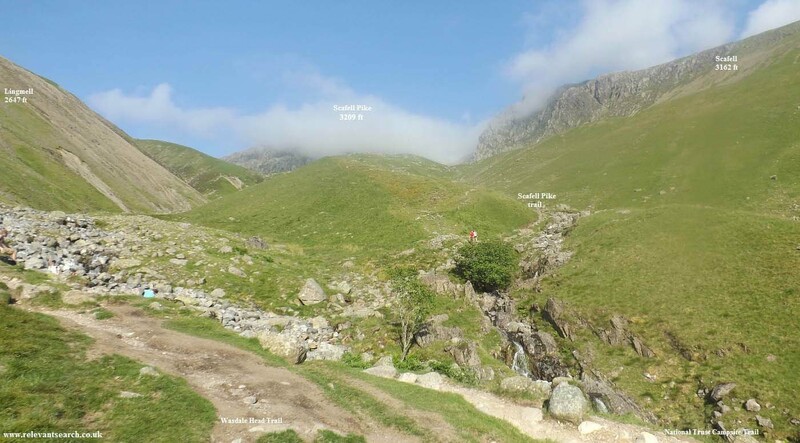 The image below is of the start of the main Scafell Pike hiking route from Wadale Head, about 100 yards south of the main car park. The style leading to the right leads to the National Trust campsite. The style straight ahead leads across the field to the bridge for the main trail. The main trail to Scafel Pike leads up to the right and around the foot of the 2,647ft Lingmell, a good easy start to the hike. The image below is from the hiking bridge across the stream. This was a long dry spell, so not a drop of water in the stream, probably a rare event in the Lake District. The trail from here follows the burn much of the way. This is the steepest section up to about 1,800ft, so about 1,100ft of tough hiking. Scafell Pike is in the cloud up there, not sure if you can actually see the top from here when there is no cloud, as it sits back behind the cliffs that you can see. I had lunch at the hotel and was only meaning to hike up to here to get this image, but there was thisk cloud from about 1,500ft, so decided to hike up a bit further. This image was actually taken on the road back down. The image below is from about 1,800ft, at the top of the steep section. The trail splits into two here. The main trail runs off to the left and up around the cliffs. The trail straight ahead leads up through the cliffs, where there is a scrambling trail at the lowest point. This image was also taken on the road back down, as on the road up, the cloud was so thick, it was even hard to follow the trail round to the left. There are a number of small trails that lead round to the left, then merge into one main trail further up. I ended up following the trail straight up, as it was easier to follow in the cloud. The image below is from the trail that leads straight up, looking over to the main trail that winds steadily up around the cliffs. The cloud lifted for a bit here, allowing this view across. The image below is nearing the top of the direct route. The cloud lifted for a spell allowing a good view of the trail. It is a steep hiking trail up here, then a bit of scrambling close to the top, taking you up to about 2780ft. Turn left at the top there, then it is about 400ft to the Summit of Scafell Pike. The image below is from the trail leading to Scafell Pike summit, looking back down at the top of the scrambling section, definately not a route I intended going back down. You cannot hike straight across there to Englands second highest mountain, the 3162ft Scafell, as there is dangerous rock climbing on that route. You have to hike down into the valley on the left, then up around the worst of the cliffs further round. The image below is from the trail close to the top. Most of the time it will be thick cloud up here, so you have to follow the cairns to the top. The image below is of Scafell Pike Summit when the sun hit the top for a few minutes. The two Welsh women here passed me going up through the scrambling section. The cloud meant there were no photo opertunities of the mountains around, so it was have a quick snack, then head back down the main trail before the cloud thickened again. I did notice on the route back down, the top section of the main trail seemed fairly steep, so not much easier than the direct route. The image below is from the steep section back down with Wast Water down there. This image shows just how steep this section is, and with it being well protected, there was little or no wind, a real tough section in a warm humid day. 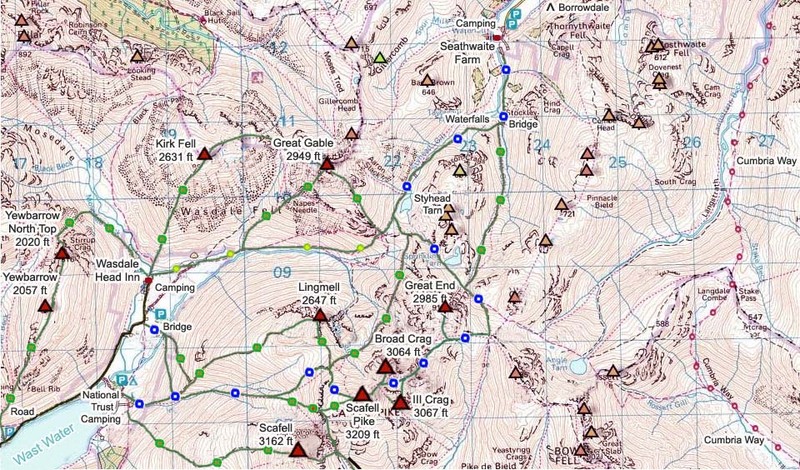 The Scafell Pike Map below shows many of the routes onto the mountains. There are a number of mountains in the area for hiking, and trails going in every direction. Best take a good detailed map with you, and a compass, as in low cloud, it would be really easy to get lost. The blue and white dots are the main trails, green and brown tougher trails, and green and yellow easy routes. Green and red are scrambling sections. Crossing from Scafell Pike to the second highest mountain in England, the 3,162ft Scafell, requires a hike down into the valley and up round the cliffs. The direct route across requires a fair amount of dangerous rock climbing. This was a scenic hike with great views of many mountains all around. The bottom section was easy hiking, second section real tough hiking, third section up through the scrambling area was tough, and final section was a steady hike to the top. I had hiked up from the north the day before, but cannot decide which is the toughest way up, as this Wasdale Head route from the west is shorter, but steadily steep almost all the way. The north route from Borrowdale has a couple of easy sections in the middle, but a tough start and final section. Photo Tour of the hike from Borrowdale.